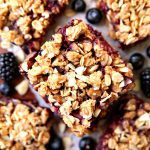 Healthy and Clean Berry Streusel Bars made with oats, almond butter, honey, and lot of berries. The perfect combination of clean ingredients make up these delicious streusel bars. Preheat oven to 350 degrees. Spray 9×9 baking pan with cooking spray. Prepare fruit filling by adding fruit and honey to medium sauce pan. Heat over medium heat and bring to a boil. Mix cornstarch and water in small bowl. Remove fruit from heat and mix in cornstarch mixture and vanilla. Let cool while you prepare oat crumble. In large bowl, mix oats, cinnamon, peanut butter, honey, coconut oil, and egg. Press 2/3 of the oat mixture into prepared baking pan. Add almonds to reserved oat mixture. Pour berry filling over oat crust. Crumble almond oat topping over berry filling. Bake in oven for 20 minutes. Cool completely before cutting into squares. Bars can be prepared ahead of time and kept in refrigerator. They are actually easier to cut if they are place in refrigerator before cutting. These Bars also freeze well.